Top v 21st today in a sunny game in Kent! BBC preview below: Defender Doug Thame is Wrexham's only new injury ahead of Saturday's National League trip to Maidstone United. Fellow defender Manny Smith has resumed training following a knee injury but is a few weeks off a first-team comeback. Wrexham are top of the National League, one point ahead of second-placed Leyton Orient. Maidstone, who knocked League Two Macclesfield out of the FA Cup, are unbeaten in their last two league games and lie 18th in the table. [QUOTE=Rob;2194811]Top v 21st today in a sunny game in Kent! Let's hope we all turn up at the right ground! Maidstone may be 18th in the league now, but they are 23rd in the home form table for their last six league games. Holroyd not even included in squad. 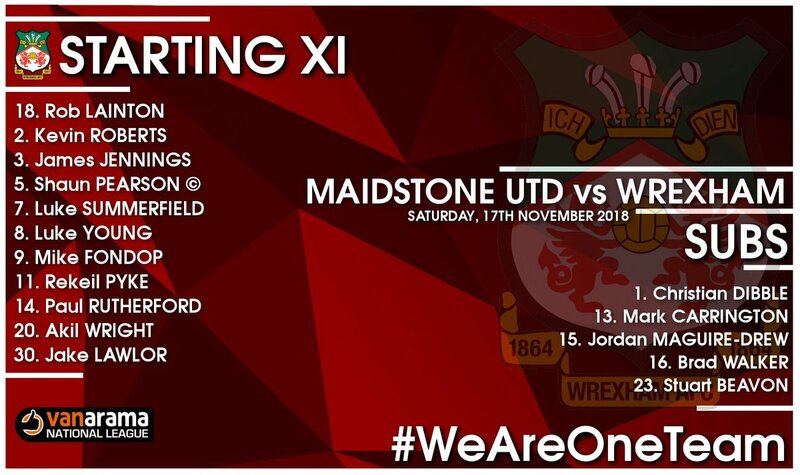 Wright in for Walker.